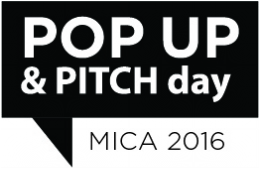 It was amazing to witness history in the making yesterday, Friday February 19, 2016 as MICA witnessed it's first ever entrepreneurship Pitch competition and Venture Pop up #PUPDayMICA16. Winning ideas were on display in Brown Atrium from 3-6pm and a panel of distinguished judges and mentors including some of the Maryland region's most exciting entrepreneurs evaluated concepts ranging from zoologically influenced textile patterns, mobile and modular playground concepts, custom high end guitars, education innovation products and services as well as a host of all others, including "Pongo" a game to unleash creativity and contain stress. Of the 21 who applied, the following 8 teams were promoted to continue on to Phase II of UP/Start, MICA's Entrepreneurship competition, which is generously funded by The Ratcliffe Foundation. These teams will have a chance to compete for up to $20,000.00 in funding for their existing or start up business. *Honorable mention goes to Join Youth Movement for winning the "People's Choice" award. "Congratulations to all participants, your ideas, creativity, dedication and more helped MICApreneurship and all of the MICA community shatter the limitations the outside world often places on creatives as business people. We are so very grateful to the Ratcliffe Foundation and President Samuel Hoi for recognizing the potential of creatives and artists as disruptive and amazing entrepreneurs. Without their support and vision for this program, the work to help students and alumni start-up, scale and successfully build viable businesses, would not be possible." Stay tuned for the Phase II of UP/Start on April 28, 2016. Details forthcoming. For business planning purposes there are a few ways that you can approach the project. Business planning, as tedious as it sounds, is important whatever kind of enterprise you're building. Business planning serves as a road map and a guide to keep you on track, coordinate your work and milestones and allow you to understand what and how you will accomplish your goals. A solid business plan is a working document that assists you in realizing your vision, staying true to your mission and gives you a useful tool to help you head off potential challenges or road blocks and measure success. There's a few approaches to business planning. The traditional business plan can range from something as basic as 1 page to an extremely lengthy and detailed document that can have dozens of pages. Be not afraid, there's a purpose to the madness. The very exercise of creating a business plan helps you in thinking through the purpose and potential growth and trajectory of your business. It should help you identify what problem you're solving, the resources you need to do so, the market you're targeting and how you're going to sell your product or service to them. "10 Essential Business Plan Components"
At times, traditional business planning can be overwhelming. Particularly for someone who hasn't done much studying of business principles, management or finance. Don't worry - there's other ways to approach business planning and get started, even if it's not something you feel 100% comfortable with. The important thing is to get started, and if you're a MICA student or alumni, MICApreneurship is here to help - don't hesitate to reach out and set up a meeting. A favorite of the start up community, the Business Model Canvas is a tool that helps you identify and visually plot things like key resources, key partners, revenue models and more. It is a great skeleton to help develop a more meaningful and complete business plan. 100Startups.com has a very handy FREE one page template that helps you get started with business planning. This is a great overview, through an article published on Business News Daily that gives you several options and resources to help you with the business planning process from templates, to wizards, to lessons and more. Like anything you get what you put into the process of business planning. Having some sort of plan definitely increases your chances for clarity, focus and success. Also, depending on if you're seeking credit, funding or investors - a plan can become critical to your ability to move forward. Like anything the more you practice at business planning the better you get at it. Good luck & if we can help - don't hesitate to reach out to MICApreneurhip.